In Designer, select the objects you would like to align, you can now use Layer > Alignment > Space Horizontally or Vertically or the Distribute options which are available. 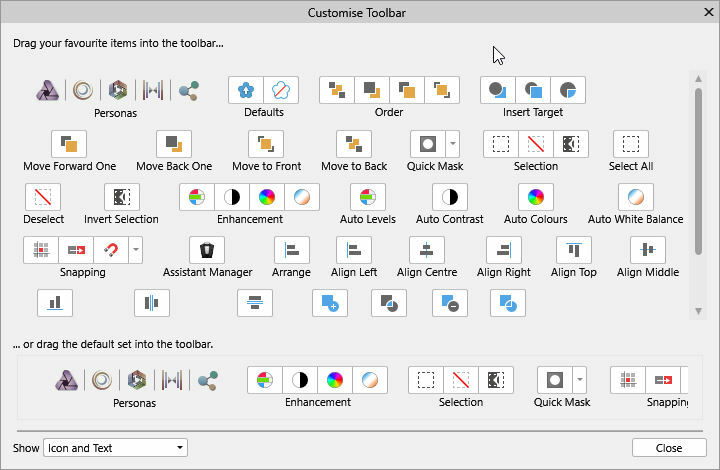 You also should have the Arrange button on the toolbar which also gives similar options. Affinity Photo has the Arrange button on the toolbar but not the options on the Layer menu. Effectively, the arrange button from toolbar is missing. How can distribute objects with a precise distance (the buffer amount) as stated on page 83 of the Affinity Designer WorkBook. Did anyone ask WHY these buttons are missing? I use this functionality constantly and there's tonnes of room up there for them. I shouldn't have to dig into some menu to find them.